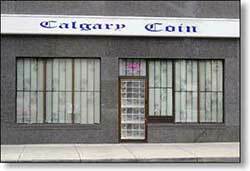 Calgary Coin Gallery offers a wide selection Canadian coins and paper money as well as ancient, medieval and modern coins from around the world. The Enmax electrical line upgrades still have much of the parking around the store restricted. They will soon finish across the street but will be moving 14th avenue and going west around the corner. If bringing a collection difficult to carry any distance please phone ahead (403-266-6262) and I can suggest options to handle it. World coins, T to Z, includes USA. I am occasionally away at numismatic shows so best to phone ahead to confirm the store will be open. I buy many types of Canadian coins and paper money, ancient and medieval, US and modern world, as well as gold and silver coins of both collectable and bullion metal values. If you have items you are looking to sell, please bring them to the store and I will be happy to assess and make an offer while you wait. I do not charge a fee to make an offer but I cannot make offers based on lists or phone calls as I have to see the actual coins in person in my store. At times it can be very busy in my store, limiting my ability to discuss collection, valuations or hand record orders on the phone, and sometimes I simply cannot do so. It is better to make inquiries by e-mail so that I can answer during quiet times or after hours. Orders can be placed by e-mail if no sensitive information, such credit card numbers it being sent. For sensitive information please use my secure order form. When time permits I sometimes do written insurance or estate appraisals. Please check with me if you need an appraisal done. I charge $75.00 per hour for written appraisals or verbal appraisals where detailed itemization is requested. Calgary Coin News is a yahoo group I use to announce upcoming shows I will be attending, major website updates, and other news I feel may be relevant collectors who follow this website. I am the only one allowed to post to it so but please feel free to join if this is of interest to you. You will need a yahoo group membership to join. The title above is a link to sign up page. I buy all types of gold and silver coins and bars but reserve the right to limit quantities of bullion I will purchase at any one time. For large quantities please call ahead. I sometimes buy scrap gold jewelry if time permits but the time consuming process of assessing the jewelry and filing the required police reports means I can only do so if the store is not busy. I purchase larger silver items such as flatware sets, but not silver jewelry. I do not buy or sell any type of silver or gold bullion through the mail. I keep only limited cash on hand so for transactions over a few hundred dollars I will have to pay by cheque. I am licensed in the City of Calgary and follow the city bylaws requiring me to file a police report on all purchases, which require the seller to provide two pieces of identification, one of which must be a government issued photo ID (driver's license, passport, etc), with the other something official but need not have a photo (heath care, credit card, etc). You must also provide proof of your address which may be on one of the ID's, but could be a piece of mail addressed to you, and you will be required to sign the report prior to payment being made. If you cannot provide the required ID, or are unwilling to sign the report, I cannot buy your items. These Kitco gold and silver charts are in Canadian dollars showing the New York spot metals converted at official exchange rates, updated throughout the day when the New York markets are open.